I’m sitting on a train, and I have a few hours to spare. In the rush to catch it I have found myself without a newspaper or a book, and there’s not even anyone to strike up a conversation with. Great as it is to have some quiet time ahead of me, the idea of gawping out of the window all the way doesn’t do a lot for me. The problem is, this isn’t what I usually draw. There’s landscape whizzing by, but it’s just not hanging around for long enough for me to get it down on paper. You see it, and it’s gone. And that’s not the way I like to work. I’m used to spending time in front of subjects rooted to the spot, even if I do like to draw them quickly. 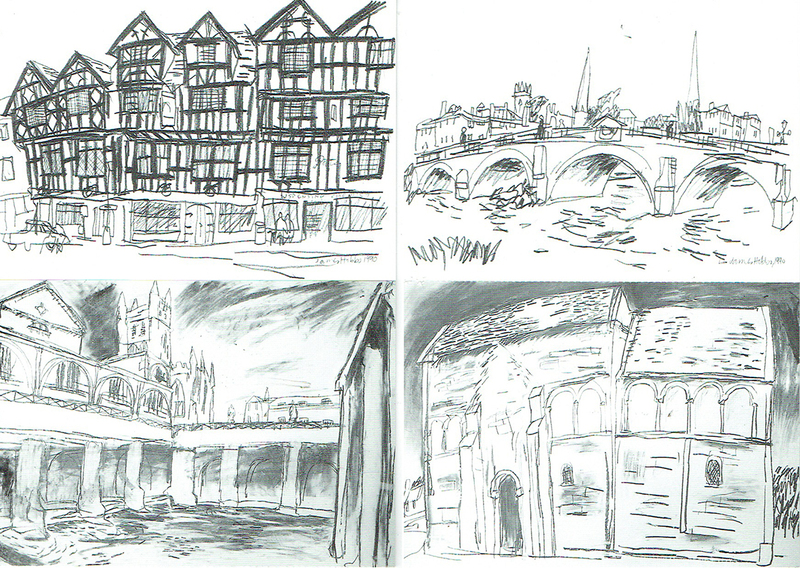 I prefer drawing buildings that have stayed in the same place, preferably for a few hundred years, if not longer. I do my best to avoid committing the human figure to paper; they shift around, make odd expressions and say things like “you’ve got my ears all wrong”. But I give the rushing scenery a go anyway. It’s a case of glimpse and draw, with minimal lines and maximum speed. And gradually, after a while, it starts to feel a little easier. It’s a sketchbook for goodness sake, so the whole point is to try things out – sometimes things work and sometimes they don’t. How do I get the essence of that tree in three quick lines? How do I make that farm look as if I’m looking down on it as it nestles in a valley, and in only a few seconds? By doing it over and over, and by making a whole series of less than successful drawings, something takes over and they almost begin to make themselves. The experience reminded me of a time when we were life drawing at art college. Tutors tend to have a habit of getting models to do very short poses, particularly in the morning, which are no doubt easier for the model and help to get the artists loosened up too. With only a minute or two to capture a pose you have to capture the essentials pretty quickly. By the afternoon things would settle into longer poses and a gentler pace. But I prefer it the other way around. Seeing Quentin Blake’s drawings again in March’s Artists & Illustrators (although I see them often enough when reading the kids a bedtime story) reminded me how much I enjoy the apparent spontaneity of his work. It made me feel like saying to him: “They must have taken you a few moments to do.” And yet mean it as the greatest compliment. It takes hard work as well as a lifetime’s experience for Blake to make them look so fresh, immediate and so right, but it took a quiet train journey to remind me of it.